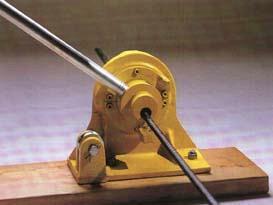 HEAVY DUTY REBAR CUTTER/BENDER Combination tool for both cutting and bending reinforcing steel. Cuts and Bends rebar up to 3/4 inches in diameter. Comes mounted on a sturdy board so you can supply all the foot pressure you need. * Please call us for any questions on our cutter bender rebar cement concrete 6 rentals in Eden Prairie Minnesota, Bloomington, Chanhassen, Minnetonka and surrounding Twin Cities communities.